City dwellers often have a love/hate relationship with tour buses. 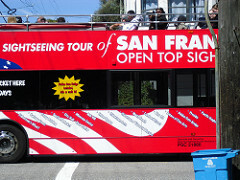 Tour vehicles block traffic when they stop to load/unload passengers or halt for a “quick” photo op and large, double-decker buses can impede sightlines. On the other hand, the tourism industry is a major source of revenue for our state and our region (per a Dean Runyan Associates study, total direct travel spending statewide in 2014 was $117.5 billion, including $29,987 million in the Bay Area and $1,760 million in Sonoma County) and a major source of jobs (per the same survey, tourism accounted for 1,0270,000 jobs statewide in 2014). Sadly, however, tour buses have been in the news recently for a reason that trumps all other pros and cons – safety. Tour bus accidents are a growing concern and our San Francisco tour bus accident lawyer represents both locals and visitors who are injured or lose loved ones in these tragic collisions. As the Chronicle notes, there have been other local tour vehicle accidents in recent memory. Just over two months ago, a runaway double-decker tour bus crashed in Union Square injuring 20 people, some critically. That vehicle appears to have had mechanical problems and had not undergone required state inspections. Another fatal pedestrian crash occurred in 2014 when a charter cable car hit a 68-year-old pedestrian near City Hall. Although not mentioned in the recent article, the Chronicle previously reported on another Bay Area tour bus crash on December 26 that left eight people injured. The Federal Motor Carrier Safety Administration’s 2015 Pocket Guide to Large Truck and Bus Statistics reports that there were approximately 66,000 crashes involving buses of all types (defined as vehicles designed to carry nine or more people, including the driver) in 2013. This figure includes 280 fatal bus crashes that claimed 310 lives, including 71 pedestrians, and 18,000 injury-causing bus crashes. Notably, there was a large jump in the estimated total number of bus crashes in 2013 with 54,000 reported in 2012, 56,000 in 2011, and 54,000 in 2010. What Causes Tour Bus Crashes? Use of poorly maintained vehicles. Of course, drivers and bus companies are not the only parties responsible for tour bus accidents. In some cases, the injured party (or grieving family member in a wrongful death action) shares some degree of fault. California law recognizes that accidents are complex. The principle of comparative negligence allows plaintiffs to recover from an at-fault defendant even where the plaintiff was shared in the fault. In those cases, the amount of recovery will be reduced to account for the plaintiff’s (or, in wrongful death actions, the deceased’s) fault. For example, if a jaywalking plaintiff is hit by a speeding motorcycle, the court might decide that the accident was 25% the plaintiff’s fault and 75% the rider’s fault. In that case, the court would typically award 75% of the total damages that would otherwise be recoverable. Given the size of the vehicles and the number of passengers on board, tour bus accidents are particularly dangerous. In addition to the issues discussed above, California’s laws on common carriers and also certain employment-related laws are often relevant in tour bus accident litigation. If you were injured or lost a loved one in a Northern California tour bus accident, you need an experienced attorney who can help you get the compensation you deserve. 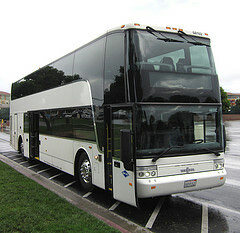 Call our tour bus injury lawyer in San Francisco, Santa Rosa, or Oakland to discuss how the Brod Law Firm can help you.